In a world of several thousand journals, is always a bold effort when a group of individuals come together to start a new literary magazine. Catharsis, it seems, has all the right reasons to begin a new journal and has all the “right stuff” to make a difference in the magazine scene. I suspect we will be seeing a variety of wonderful offerings from them in the future! 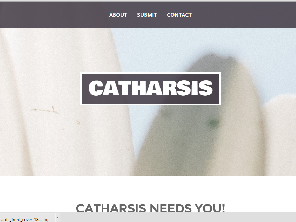 Congratulations on the start of your new magazine Catharsis. With thousands of magazines out there, what made you want to start a new journal and how do you hope do differentiate yourself in the literary world? Starting a new literary magazine amongst the masses of literary magazine is truly a daunting task. We felt a wide majority of the current literary magazines were lacking fictional stories, poetry, and creative essays about people from around the world. Even though we are based in the state of Georgia, but we hope to differentiate ourselves by publishing realistic fiction from around the world. What is the expected launch date? Submissions for our first issue ends October 31st. Most of November will be spent carefully going through our submissions and selecting our strongest pieces. We expect to launch our first issue in early December. What kind of staff do you plan to have on board? Do you have the team assembled and if so would you like to introduce us to your Masthead? Currently we are housed by a creative group of dedicated writers, passionate readers, and creative artist. This team communicates daily and every 3 weeks, we try to meet up all together and discuss plans over breakfast to keep everyone on the same page. How do you plan to build your readership? Do you have a certain demographic or audience in mind as you build your readership? One of the hardest things for starting publications would be building up their readership and reputation. We plan on building our readership by being active on our social media pages and hosting monthly events to get people reading our magazine and supporting our many authors and writers featured in our magazine. We hope to build readership in the younger generation in their early 20’s who are interested in writing as an art. Will you be publishing Poetry, Prose and or Non Fiction? What led you to the decision of what genre you will publish? Catharsis publishes realistic prose and poetry centering on self-discovery and contemporary social issues. I personally chose these genres to publish as a means of authors to explore not only their backgrounds and identity but as well as their writing styles. Catharsis gives the microphone to the small ideas scattered across the world to express their ideas through fiction. Will you be publishing reviews of books and interviews of selected authors? As of now, we will not be publishing reviews of books. But in the future we hope to start a featured segment called ‘Why I Keep Writing’, which focuses on authors who’ve dealt with insane amounts of trouble both mentally and physically to continue writing to inspire others to continue writing. Will this be a full time endeavor for you? Or do you have a career outside literature (Like many of us do) you’d like to mention? As any other writer in the world out there. I’d love to become a full-time blogger and author, but currently as of now I can’t or any of our masthead can give up their duties to their family, careers, and education pursuits to consider this a full time endeavor. Even though this may not be a full time endeavor you can count on us to continue to make this an enjoyable magazine with quality in mind. Every single issue we publish will be to the upmost of our quality. Not only do we represent ourselves as the creators and minds behind this magazine but we also represent every single author published in our magazine. Catharsis gives the microphone to the small ideas scattered across the world to express their ideas through fiction. What are your plans for the social media scene? As you know, that can be so critical these days. What are your thoughts about the importance of social media with regards to the life of a literary journal? You can find us all over the social media scene. We will be embarking into social media as a way to advertise our magazine to new readers, authors, and other magazines as a means to communicate with us. We hope through entering into the social media scene we are not only able to expand our readership, but also create a community of likeminded readers and writers. Who are a few poets and or prose writers you admire the most and why? How did they cause a catharsis in you? Khaled Hosseini, John Steinbeck, Mo Yan, and Ernest Hemingway have influenced my writing, values, and viewpoints on life. Each of them have effectively created strong characters who mimic us as humans, as well as bringing attention to parts of the world we wouldn’t normally be thinking of. Ernest Hemingway of the Spanish Civil War and World War I to me encapsulates the disruption of war on the human mind and the effects on our relationships, emotions, and psyche. Reading through their works has allowed me to look at the world through a new lens. How did you come up with the name of the journal? How do you hope the word “Catharsis” apply to your new magazine, now and in the future? Catharsis - n. the process of releasing, and thereby providing relief from, strong or repressed emotions. We came up with the name of our journal through a random list through our dictionaries until we stumbled upon this almost forgotten word called Catharsis. After bouncing the name back and forth, eventually it stuck. We hope authors see our magazine as a way to find relief and be able to express their strong emotions for social issues, their own self experiences, and discoveries. Will the issues be published monthly? or quarterly? or something different? Currently we will be publishing our magazine quarterly in electronic format. But in the future we hope to expand our magazine into print. For our first issue will be doing a limited run for a print issue of our magazine for our early backers on our Kickstarter! Anything to add about your new endeavor that you want potential readers and writers to know? We know we are the new kid on the block. But we are completely invested in talking to readers, bloggers, and authors! We are completely psyched to get this magazine off of the ground and we can’t wait for the release of our magazine! Every single opinion means the world to us, concern, or thought feel free to email me! Connie Post served as the first Poet Laureate of Livermore, California from 2005 - 2009. Her work has appeared in The Big Muddy, Calyx, Cold Mountain Review, Crab Creek Review, Comstock Review, The Pedestal Magazine, Slipstream, Spoon River Poetry Review and The Valparaiso Poetry Review She was the winner of the Cover Prize for the Spring 2009 issue of The Dirty Napkin and the winner of the 2009 Caesura Poetry Awards. Her work has received praise from Al Young, Ursula LeGuin and Ellen Bass. She has been short listed for the Muriel Craft Bailey awards (Comstock Review) Lois Cranston Memorial Awards (Calyx), Blood Root Literary Magazine, the Jack Kerouac Poetry Prize and the Gary Gildner Award (I 70 Review). Her Chapbook “And When the Sun Drops (Finishing Line Press) won the 2012 Aurorean Editor’s Choice Award. Her first full length book “Floodwater” was released by Glass Lyre Press in 2014 and won the 2014 Lyrebird award.